EAW035674 ENGLAND (1951). Waterloo Station, Hungerford Bridge and the Festival of Britain South Bank Site, Lambeth, 1951. This image has been produced from a damaged print. 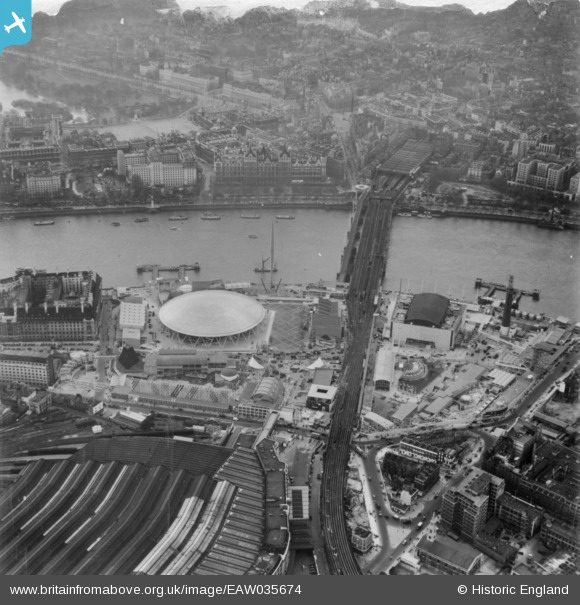 Title [EAW035674] Waterloo Station, Hungerford Bridge and the Festival of Britain South Bank Site, Lambeth, 1951. This image has been produced from a damaged print. Bailey Bridge providing an additional access point to the South Bank site for the Festival of Britain 1951.